With a passion for design and material, Anne Cohen combined the two to create one of the most unique jewellery brands yet. C6 derives from the designer's love for the element carbon due to its simplicity as an atom and scientific complexity as an element. 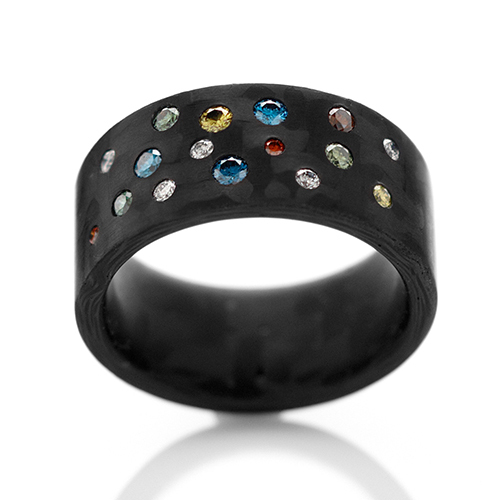 By combining with precious gemstones and diamonds the dream of making a ring of pure carbon is realised; the ring is essentially a narration of her life. By combining science and aesthetics, C6 brings gemstones to the forefront and away from the overcompensated 'couture' design trend. Against the carbon canvas it allows the gemstones to captivate the wearer or blown away by the fact that carbon and diamond are essentially identical yet aesthetically different. C6 core philosophy is to create a design that is minimalist as well as authentic, resulting in an innovative and timeless piece. The Supernova ring plays with an idea of time, space and being. You can't help but compare it to gazing at the stars during the darkest of nights, still in utter wonderment by the universal intrigue of space and living. At least with the ring, you have one within a touchable distance. Labels: c6 by anne cohen, carbon, Contemporary jewellery, Minimalist Jewelry, Ring, Rock it!